The last time I made this Healthy and Easy Oat Pie Crust Recipe, it was to make two shallow vegan coconut cream pies (click to view recipe). I had plans to make a pumpkin-pie-with-a-twist on Thanksgiving day, so I decided to see how the crust would work a) as one not-shallow pie and b) with the pumpkin pie experiment I was developing. As it turns out, both worked great! I thought it would be best to post the pie crust separate from the new pumpkin pie recipe (which will be next) since it goes with many types of pies. I also wanted to repost the crust recipe with updated photos and instructions for a single pie. I haven’t tried making a single non-shallow single coconut cream pie yet, but maybe I’ll do that next. Till then, I know the two-pie method yields delicious results. 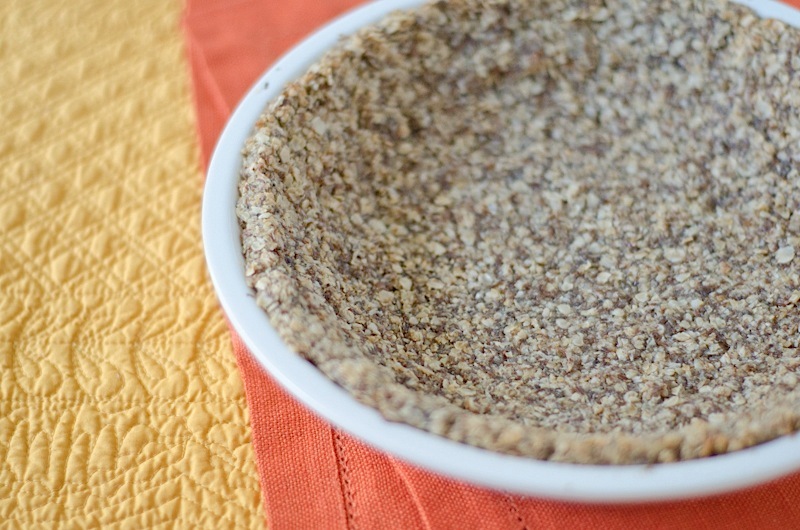 This Healthy Easy Oat Pie Crust Recipe is my attempt to make a pie crust that is slightly more healthy than traditional pie crusts. Rather than using lots of flour, this crust is made with oats, flaxseed, and chia seeds. This crust has a slightly chewy texture that I really enjoy. I hope you like it, too! Pre-heat oven to 350 degrees F and spray a pie dish with non-stick spray. 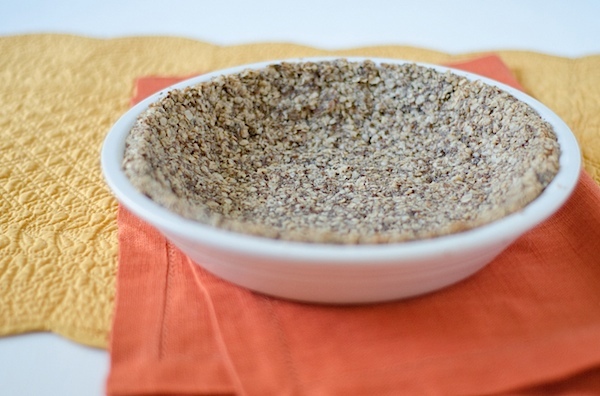 Mix 2 teaspoons chia seeds and 6 teaspoons water and set aside to gel up for at least 5 minutes. 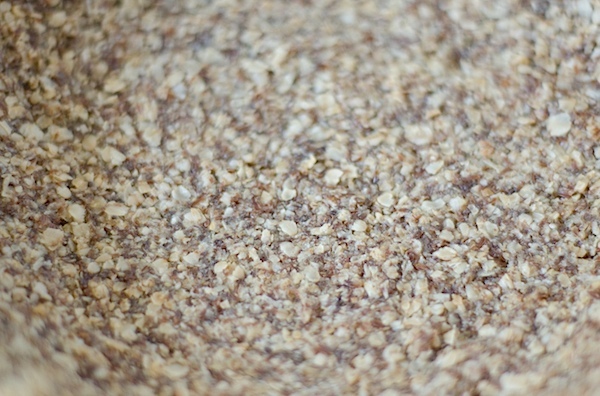 Whisk together oats, flaxseed meal, coconut flakes, and salt till evenly combined. 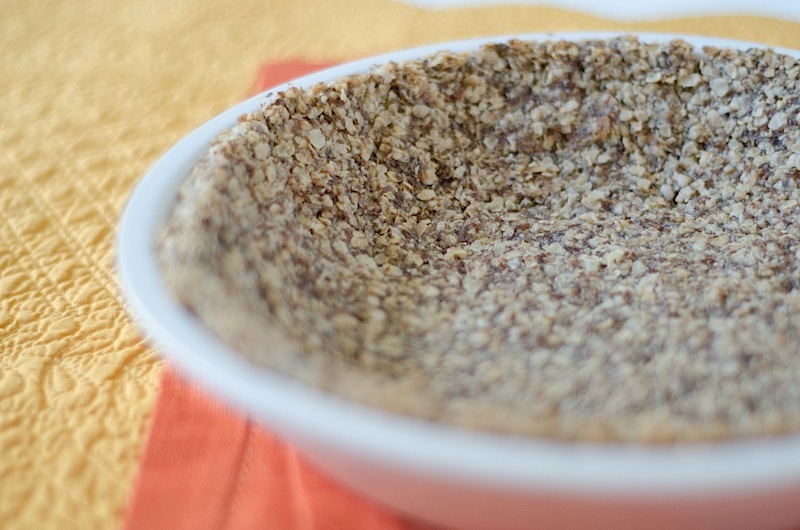 Stir in agave, oil, hot water, and chia seed mixture until well combined and ingredients are evenly distributed (but don’t over-mix). Pour into a pie dish and press mixture into bottom and up sides of dish. 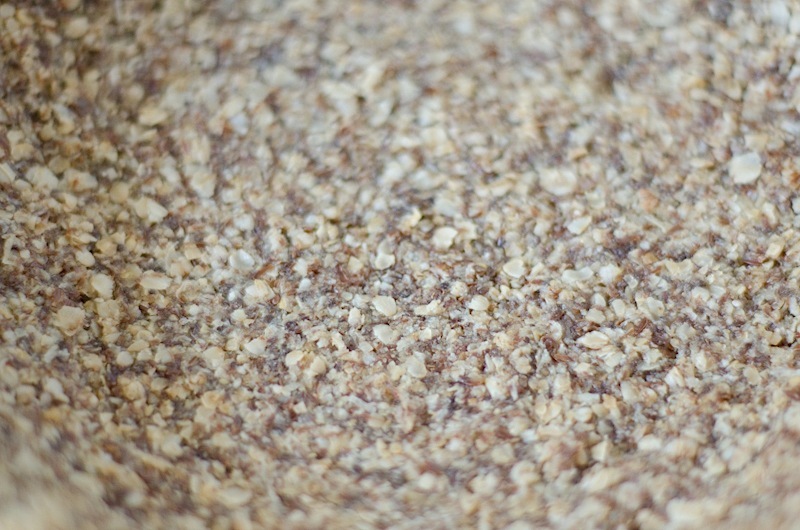 Bake for 14-16 minutes or until top edge just starts to turn golden brown. Set aside to cool to room temperature. Fill with your favorite pie filling – try this yummy Coconut Pumpkin Pie recipe (click). I’ll be sharing my pumpkin pie with a twist recipe next! Stay tuned for that plus two recipes using your Thanksgiving leftovers! Click here to check out my Facebook page. Thanks for reading! 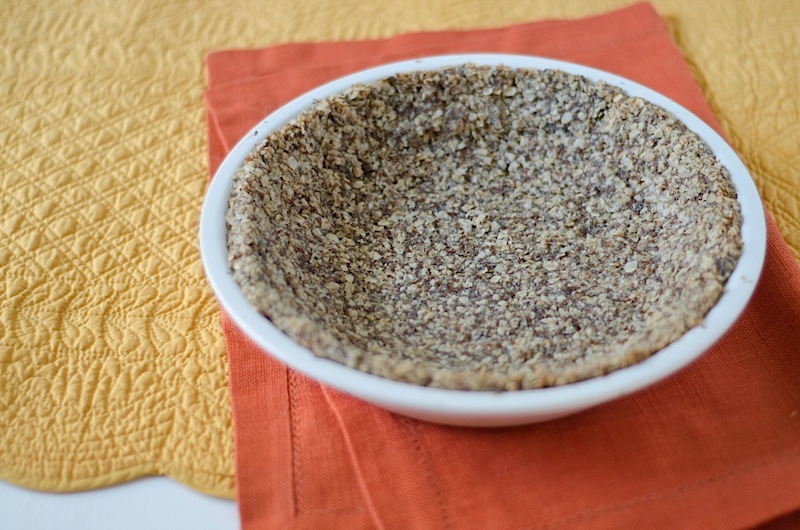 Hope you like this Healthy Easy Oat Pie Crust Recipe! 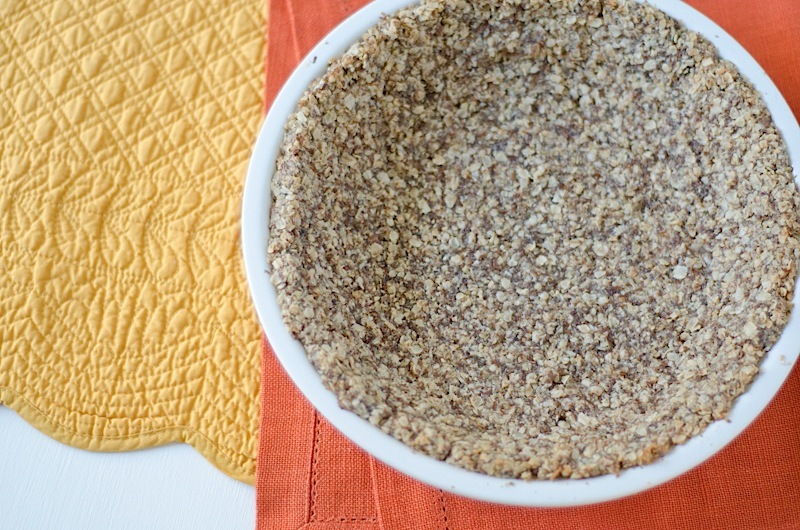 Reader question: What kind of pie filling do you think would best go with this Healthy Easy Oat Pie Crust Recipe? Great suggestion! 🙂 Thank you!